The Kent School of Architecture are delighted to announce that the 8 person KSA team consisting of Andra-Lilian Oprea, Andrew Caws, Anna Reeves, Colleen Laurent, Elliot Bennett, Kyle McGuinness, Shefield NG and Zhi Bin Cheah has won this year’s American Institute of Architects Student Design Charrette held at the Roca Gallery in London, seeing off strong challenges from contemporaries at UCA, Ravensbourne, Oxford Brookes, Robert Gordon, Portsmouth and Westminster universities. The AIA’s now well-established charrette is an opportunity for UK design students to collaborate and compete in teams being mentored by practising architects over the course of a suitably intense (but fun) day of creativity. This year’s brief, set in the Chelsea Harbour area and environs surrounding the Roca Gallery, invited architectural and urban speculations based around the idea of food or beverage production, consumption and distribution of a chosen, or invented, product drawing inspiration from this area of London being the home of the Chelsea bun. 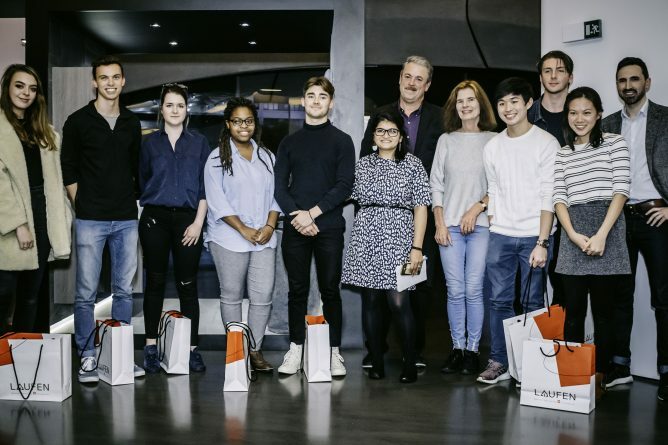 The judges were won-over by the students’ inspired proposal for converting the site’s old power station into a speciality bread-making factory re-establishing a sense of place with a production, distribution and consumption cycle based on the local tide. This was further enhanced by reusing the chimneys to infuse the neighbourhood with the smell of freshly baking breads(!) giving a much needed sense of identity, and more wholesome character, to the this area’s ongoing mix of bland or blingy redevelopment. Special thanks due to the unwavering encouragement of our mentor Bea Sennewald throughout the day, along with excellent AIA organisation and generous support from Roca and Laufen for hosting. Feature image by Braima-Edusei Owusu-Nyantekyi. For further information, please refer to the AIA blog and photo gallery. 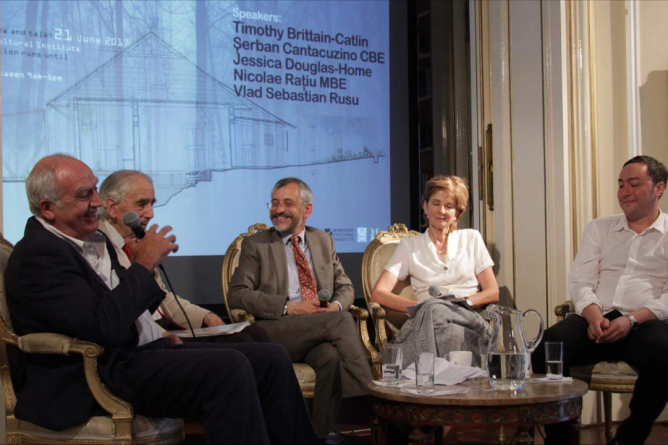 Timothy Brittain-Catlin chaired a distinguished panel of conservation activists on Wednesday 20th June at an event hosted by the Romanian Cultural Institute as part of the London Festival of Architecture. The panel comprised the architect, writer and conservation pioneer Sherban Cantacuzino; the philanthropist and founder of the Pro Patrimonio Foundation Nicolae Ratiu; the author and conservation activist Jessica Douglas-Home; and the award-winning architect Vlad Sebastian Rusu, and the discussion was held to accompany the current exhibition of a number of fascinating recent conservation projects at the Institute. Sherban Cantacuzino related the history of the newly restored early nineteenth-century vernacular cottage where the composer George Enescu had been born, and Jessica Douglas-Home talked about the work of the Mihai Eminescu Trust, including the beautiful fortified church at Alma Vii in Transylvania. The Cultural Palace in Blaj, restored by Vlad Sebastian Rusu, has just been awarded this year’s EU Prize for Cultural Heritage / Europa Nostra Awards in the Conservation category. The evening attracted a large crowd and was attended by HRH Prince Nicholas of Romania. Image: Left to right, Dorian Branea, director of the Romanian Cultural Institute; Nicolae Ratiu; Sherban Cantacuzino; Timothy Brittain-Catlin; Jessica Douglas-Home; Vlad Sebastian Rusu.